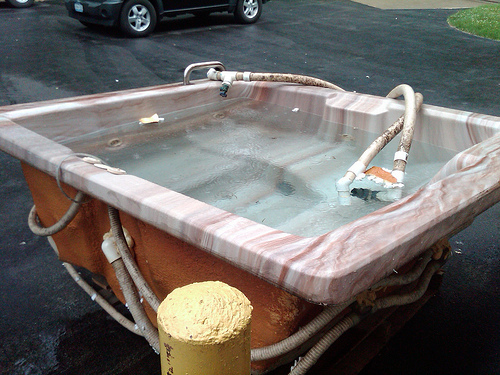 Service Costs > How Much Does it Cost to Move a Hot Tub? Moving a hot tub may be needed if you are a hot tub owner who is moving from one home to another or selling to someone else. Since a hot tub can weigh hundreds of pounds, it can be hard to move it with just one or two people. It is also dangerous for the people who are not experienced since it may end up causing damage to the unit. Because of this, a professional service may be needed to move the hot tub to another property or location within the home. With most companies, the cost of moving a hot tub will depend on the size, the distance it needs to be moved, and if there are any unforeseen difficulties. For example, if a hot tub will not fit through a door, a crane may have to be called in, which of course, could get costly. On average, plan on spending $200 to $550 to move a hot tub less than 35 miles. If the hot tub only needs to be moved from one point to another on the same property, then most quotes will be within the $150 to $250 range, depending on the distance the movers have to travel to your home. To get an exact quote for your particular situation, consider getting multiple quotes for free from HomeAdvisor.com. Here, you can explain your situation and licensed movers will contact you with a free, no-obligation quote. Superior Spa Movers, located in Florida, lists prices on their official website. According to the pricing list, same property spa moves start at $150 while location to location moves start at $200, plus the fuel charge. A screened enclosure can add an additional $75, while steps, stairs and/or tight areas can increase the pricing as well. Before moving the hot tub, the movers will empty it to get rid of any excess water; however, some professionals may require that you do this part; it is going to vary from one moving company to another. Once emptied, it will be unplugged and dried from the inside out. After this is accomplished, the movers will be able to position a handful of furniture dollies around the hot tub to move it around the house or onto a moving truck. Most of the time, it can be dollied to a moving truck, but in some circumstances, as mentioned prior, a crane may be needed. As stated above, if a crane has to be called in for hard-to-reach places, the crane alone could cost an additional $350 to $2,000, depending on the size. Areas with a large slope, a gazebo attached and/or a swim spa tends to be on the higher end of quotes. Any additional wiring work at the new location needs to be budgeted for. Working with stairs and/or railings can often increase the costs. Before you call and hire a moving company, have as many details as possible ready. This is going to include information such as the make, model, and size of the hot tub as well as your specific situation and the reason for the move. When choosing a professional, make sure you ask about their experience. Since they will be dealing with a fragile item, you are going to want to make sure they have the right equipment to move your hot tub. If the hot tub is going to be moved from a warmer climate to a cooler one, it may be ideal to have the water removed with a high-pressure vacuum. Even if the hot tub seems to be empty, there may still be water inside the pipes and connections. Make sure that you empty the water completely to avoid making a mess and causing damage to the unit. Ask about a guarantee that is made by the company. If one of the movers makes a mistake and drops the hot tub, will the damage be covered or the hot tub replaced? If they are not willing to guarantee the safety of your hot tub, you may want to find a different company that will. Always make sure they are insured. Chances are there will be a handful of moving companies that will be more than happy to move your hot tub. Before you sign a contract, try to obtain as many quotes as possible before committing. However, do not focus on the price. You are going to want to make sure that the moving company has great references, the right equipment, experience and insurance.